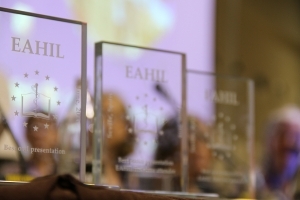 Are you giving an oral or poster presentation at EAHIL 2018? Did you know that prizes are awarded at Conferences and sometimes at Workshops? Winners of prizes also earn a free registration for a future EAHIL event — definitely something of value! The International Programme Committee of the event manages the evaluation committee and scoring process. We recommend that you use the criteria in preparing your oral or poster presentation – even if you don’t care about winning the prize, we hope the criteria would help as a checklist to give you confidence in your work and improve the quality of your presentation. Prizes are announced at the closing ceremony of the event. The free registration prize must be used within two years. The speaker or lead author may allocate the free registration to a co-author if they cannot use it. For multiple speakers/authors, there is still only one free registration prize, and they will need to agree on who gets to use it.